Nzinga Soundz: DJ Ade and Junie Rankin. Courtesy of Nzinga Soundz. 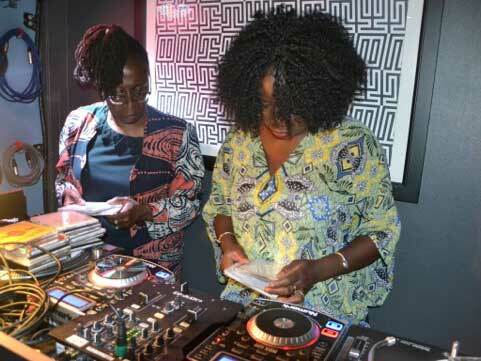 As part of a day celebrating the ways women, sound and race intersect to take aim at the social order, Nzinga Soundz – one of the UK’s longest-running all-women sound systems – lead a workshop aimed at cis and trans women who would like to develop vinyl DJing skills, either from scratch or building on digital DJing experience. Traditionally a male-dominated arena, the reggae sound system Nzinga Soundz comprises DJ Ade (Lynda Rosenior-Patten) and Junie Rankin (June Reid). Together they will teach vinyl DJing skills and shared technical knowledge, such as how to balance sound, positioning the speaker boxes and mixing tracks, as well as interpersonal skills, including reading your audience, using the mic and big ups. Come and try your hand at playing your own vinyl DJ set using industry-grade equipment. A Sound Identity is a day celebrating the ways women, race and sound intersect to resist the social order. This programming is part of In formation III, a discursive platform emphasising collective production and learning, and forms of sociality. This expansive series of presentations, workshops, performances and participatory events is collaboratively organised by the ICA curatorial team and staff members. Nzinga Soundz was established in the early 1980s by Lynda Rosenior-Patten and June Reid. The sound has played at concerts, corporate events and community-based events across the UK and in the Gambia, Barbados and Sierra Leone. Rosenior-Patten and Reid have also presented papers at conferences at Goldsmiths University, the University of East Anglia and Birmingham City University.